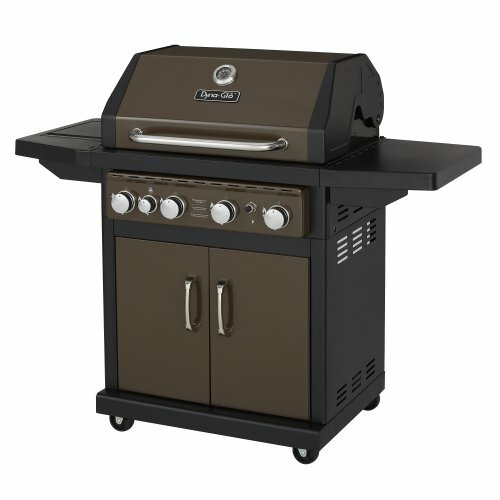 Just about all gas grills come standard with at least 2 burners. But if you’re looking for a better performing, top-notch gas grill suited for feeding a crowd and cooking a wide array of meat simultaneously, then 4-burner gas grills are what you should be considering. It is ideal to have 4 burner gas grills if you have more space available in your room since these grills tend to have bigger foot print and best if placed on your backyard. 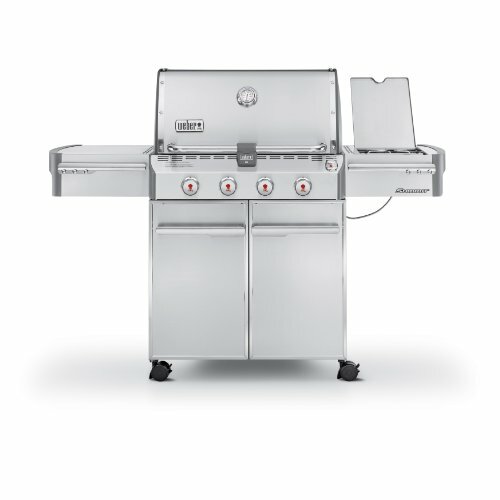 Since it’s bigger and close to the full sized gas grills, it usually comes with a side burner feature already, have bigger cooking area and be able to cook more meats at the same time. You can host a barbecue party and get together in your place and be popular among your peers! These grills are common choice average grill enthusiasts. They have a balance for size and performance. Read further to know which made it to the best 4 burner gas grills. Dyna Glo Bronze gas grill may have bronze metallic finish, but it definitely wins the gold prize to make it to our list of best 4 burner gas grills. Even a novice can make wonderful dishes and win the hearts or stomaches of your loved ones. It has a really sturdy construction with burners made of stainless steel, cast-iron enameled cooking parts and a double wall lid with bronze metallic finish to its overall body to help retain the heat better while cooking and prevent the coat from peeling. But to be fair, its metal parts are also not very thick but would last for years with proper care. Not to mention, it is pretty easy to clean so you can maintain this regularly and extend its life. The unit also contains 4 tents which are enamelled, sits above the burners, which adds flavor to the barbecue you are cooking. It has a good design and a performance to be proud of. This is a powerful machine that has a little more cooking space than average 4 burner gas grills with a total area of 666 square inches and greater heat capacity. You can cook for around 24 burgers all at the same time. It produces 12,000 BTUs for each burner so it can get really hot and very quick. So you might have to keep an eye on the temperature or it might burn your steak or any food you are cooking. But what’s great since it can cook your food fast, your can enjoy your dishes in no time without waiting too long for it to get cooked. 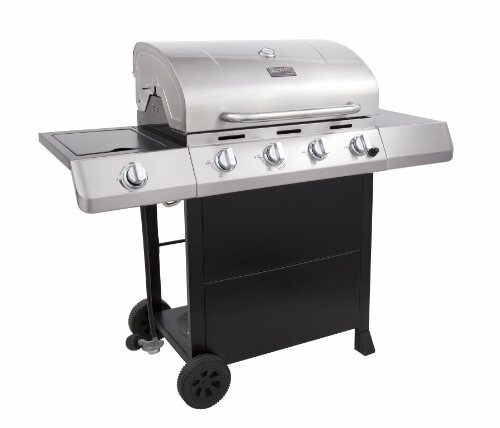 Aside from the basic features, it offers a few extra perks such as the temperature gauge ring to help you monitor the heat and how hot it’s getting while the lid is closed, electronic ignition for faster and matchless lighting, easy to read dial and 4 heavy duty wheel casters to allow you to move it around without a hassle. Two of the wheels can also be locked so it will not move around too much when you cook. Although you may have to buy a rotisserie kit separately, this grill is already capable to connect with a rotisserie kit for roasting those juicy turkeys. You can easily find a universal design with 35 inches long to fit the grill and works great. It a little more expensive than the Char Broil, but it has better construction and has few extras to offer. Assembling the grill will also be a breeze, you can even build this with a help of a young teenager. It received a high satisfaction score of 4.4 out of 5 user rating and is available for around $350. It also provides a one year limited warranty wherein the Dyna Glo actually provides great customer value and has an excellent service. The Summit series are offered as Weber’s top of the line gas grills. Among the best 3 burner gas grills, the Weber Summit gas grill models have one of the biggest cooking area, most feature to offer and durable constructions to last for long years. But with that said, it is also one of most expensive gas griddles among others. Like the Genesis gas grills, the Summit grills have almost similar specifications worth checking out as well. But at this time, we focus on the Weber Summit S-420. It is made up of stainless steel to prevent rust and optimize durability. If you come across the Weber Summit E-420, it is actually the same with S-420 but only differ in built as it is made of porcelain enamel. But given that the selling price of the two is also the same, then it is ideal to go for the S-420 with a stainless steel construction for a better value for your money. Here’s a quick look on its product features. The Weber Summit S-420 is a little pricy. You can surely find a basic gas grill that have 4 burners and a side burner that can also cook just as well at a lower price. But those will not carry the name of a Weber, which guarantees quality, durability and customer support. By adding a few more bucks, you can upgrade from the Summit S-420 to S-470. You can own a griddle with a complete set of features to look for in a gas grill. The Summit S-470 has main burners, side burner, sear station, smoker and rotisserie burner. You will have more diversity in your cooking as you can cook in different ways and try new recipes. The Summit series are also available to run with natural fuel. Keeping up with today’s innovation on gas grills, Char Broil is not one to get left behind. A combination of stylish design and functionality, Char Broil improves on both departments and now brings you its Classic 4 Burner Gas Grill. A revolutionized gas grill that can deliver great performance and has stayed away from its traditional all black appearance. This model has 4 burners, comes with a side table and side burner. It also has heavier and better construction than the average Char Broil gas grills, wherein this unit is already built with some stainless steel components such as the burners, lid, handle and control panel. However, these stainless parts are still not of the highest grade, but is durable to withstand rust for quite some time and to last for several years. Here’s a roundup of its product specifications. The Char Broil Classic Gas Grill offers you a large cooking surface and an additional 180 square inches extra space, which gives you a total of 665 square inches cooking area. It is not low on power either as it can get real hot of up to 40,000 BTU, gives off great heat efficiency for its size. The side burner produces 10,000 BTUs. It might be a little low to do any real cooking, but it’s capable enough to warm the sauces or cook simple side dishes, which just might take a little while. Its metal parts are not too thick that it might get dented when hit really hard. It is pretty heavy, has a sturdy stand and rigid built, but its roller casters help you move it around with ease. Even if this is your first grill, the instructions are clear and adequate to know the ins and outs of it real quick. It is pretty easy to use and also to assemble. Upon delivery on your doorstep, you can fire this up in just few twists. It’s a little tricky to fit the battery to the compartment but once you get it in correctly, the electric ignition works very well. The cast iron grates provide great cooking satisfaction, the food will also not stick and with proper cleaning, will stay that way for a long time. It has everything you need which makes the Char Broil Classic gas grill a great value for your money and satisfaction in your grilling needs. This is available for only $295, but you can even find greater deals that offer this unit at a lower price of $189 like in Amazon.